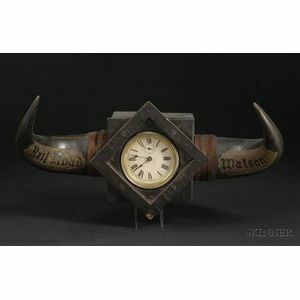 Presentation Clock with Buffalo Horn Mount, c. last quarter 19th century, the Waterbury Clock Co., U.S.A., patent dates September 11, 1877, and January 15, 1878, the horns etched with "Railroad Watson" against a textured background, lg. 19 in. 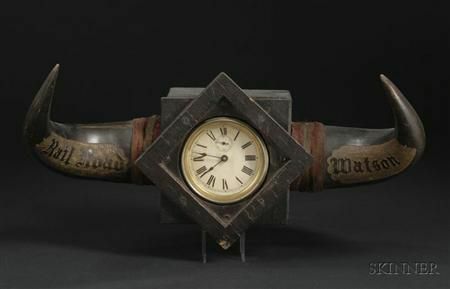 Note: Probably owned by John Richard Watson, an Englishman who came to California during the gold rush, but from the 1860s-1880s, worked for the Central Pacific Railroad of California, and was a participant of the Golden Spike ceremony on May 10, 1869, in Utah. A history is included.